Market expectations that Samsung could debut its foldable smartphones next year grew Tuesday, after the latest in a series of related patents was registered by the tech giant’s affiliates in the US. The United States Patent and Trademark Office granted Samsung Display, a display unit of the South Korean electronics giant, a patent on foldable display device on Sept. 27, the US office’s online data showed. 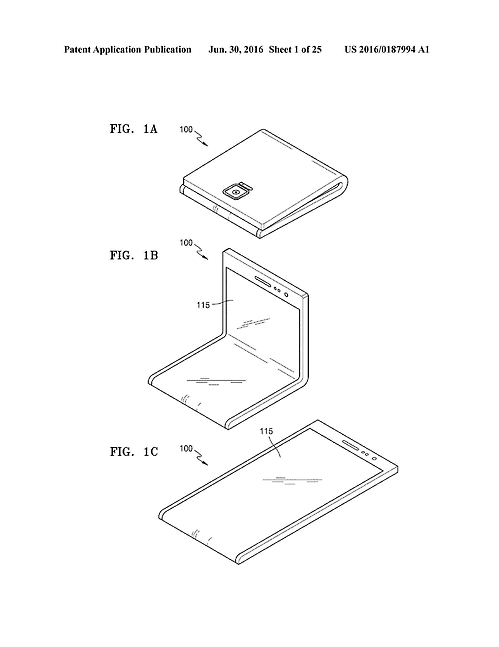 A blueprint of Samsung's foldable smartphones submitted to the USPTO. Registered as No. 9,455,306, the patent concerns foldable display apparatus and its manufacture, it added. Samsung applied for a patent from the US patent office on Dec. 6, 2013. “The foldable display apparatus includes substrates including a metal thin film and an insulating layer provided on the metal thin film, an organic light-emitting unit formed on the substrate and emitting light in a direction away from the substrate, and a thin film encapsulating layer for encapsulating the organic light-emitting unit,” according to the patent full text published online. “The foldable display apparatus may be folded in a direction such that the metal thin film is exposed,” it added. The case is one of 30 US patents that relate to foldable displays secured by Samsung Display and Samsung Electronics. Of them, 14 cases were granted this year. A recent Bloomberg report also suggested that Samsung could unveil the smartphones at the Mobile World Congress in Barcelona in February. When about the release of foldable smartphones next year, a Samsung Display official played down the market expectations, saying that the patents was just some of many R&D projects. Foldable displays have been touted as the next generation technology to lead the tech market in near future. A major shift in display features is possible due to the invention of panels using OLED displays. Samsung has been dominating the production of small OLED displays for smartphones while LG has taken a lead in bigger panels for TVs and monitors. LG Electronics and LG Display are reportedly working on manufacturing TV screens that can be rolled up. Kwon Bong-suk, executive vice president and CEO of LG Home Entertainment Company, denied the market speculation at a press conference last month that it could be flexible TVs, but not necessarily rollable TVs that debuted next year. But market insiders in South Korea said there was a high possibility of LG’s rollable TVs making a worldwide debut next year at the CES electronics fair in Las Vegas. LG Display has been leading a government project on transparent flexible displays, they said. The team is assigned to release a mid-term outcome -- rollable TVs -- within this year, they added.